SAMLESBURY, a township-chapelry in Blackburn parish, Lancashire; on the river Ribble, 2 miles E S E of Fulwood r. station, and 3¾ E by N of Preston. It contains part of Mellor-Brook hamlet, which has a post-office under Blackburn, and Roach hamlet, which has a cotton-mill. Acres, 4,270. Real property, £6,951; of which £10 are in quarries. Pop. in 1851, 1,435; in 1861, 1,215. Houses, 236. S. Old Hall is the seat of J. Harrison, Esq. ; was erected in 1530, by Sir T. Southworth; was moated till the formation of the new road from Preston to Blackburn; contains a great hall, constructed of Massive and elegantly carved oak timbers; and was restored and finely embellished in 1864. Roach Hall dates from 1675, was long the residence of the Hoghton family, and is now a farm-house. The living is a p. curacy in the diocese of Manchester. Value, £150. * Patron, the Vicar of Blackburn. The church is ancient. There are a Roman Catholic chapel, a national school, and charities £35. Details about the census records, and indexes for Samlesbury. You can also perform a more selective search for churches in the Samlesbury area or see them printed on a map. The Register Office covering the Samlesbury area is Preston & South Ribble. Ask for a calculation of the distance from Samlesbury to another place. "SAMLESBURY, a township and chapelry in the parish of Blackburn, lower division of Blackburn hundred, county Lancaster, 4 miles N.E. of Preston. The village, which is considerable, is situated betwixt the rivers Ribble and Darwen. The land is chiefly meadow and pasture, with a small proportion of arable and woodland. The soil is chiefly of a clayey character. Some of the inhabitants are employed in the cotton-mill. The living is a perpetual curacy in the diocese of Manchester, value £150, in the patronage of the Vicar of Blackburn. The church, dedicated to St. Leonard, is an ancient stone structure with a bell turret. The parochial charities produce about £35 per annum. There is a National school for both sexes. The Roman Catholics have a place of worship. In the vicinity is the old mansion of the Southworths, now occupied as a ladies', boarding-school." In 1835 Samlesbury was a chapelry and township in the parish of Blackburn. You can see the administrative areas in which Samlesbury has been placed at times in the past. Select one to see a link to a map of that particular area. View maps of Samlesbury and places within its boundaries. 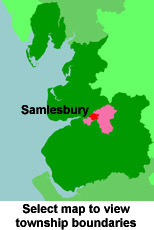 For probate purposes prior to 1858, Samlesbury was in the Archdeaconry of Chester, in the Diocese of Chester. The original Lancashire wills for the Archdeaconry of Chester are held at the Lancashire Record Office.